The fabric I used for this shirt is a wonderful double knit cotton. It's thick enough not to show my bra and but comfy and sporty. I want this fabric in every color. The key to making almost any kind of zippered skirt without buying pattern after pattern is to start with a well fitted yoke. 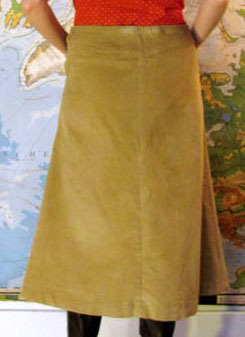 The yoke is the upper part of a skirt that fits over the hips. You can attach many, many kinds of skit to that (ruffled, pleated, flared, tiered, A-line, etc...) and each time end up with something that fits perfectly. Usually, I'll pull a yoke off of a skirt I like and then use that over and over again. Today's yoke comes from one of my favorite Japanese pattern books. The skirt attached to it is box-pleated and has a black bottom border. I made it to wear while giving blood tomorrow, the colors are Halloween festive. I'm in love with the new line of bird-themed fabrics at IKEA. They're reasonably priced for what you get and the designs are just fantastic this season. The chickens seem to like them, too. Every once in a while I'll learn that I've been doing something completely wrong my whole life, completely unaware. Luckily, when I make such a surprising discovery, I usually learn what I did wrong. Thankfully, those instances get rarer and rarer as I age, but I guess that's what makes them more disorienting. Case in point, I have never, ever made a cup of Jasmine tea correctly in my entire life. I've been in love with Jasmine tea ever since drinking it every day for breakfast during a trip to Thailand. With just a little cream and sugar it is a cup full of happiness. When I returned from my trip, I was determined to continue my ritual. 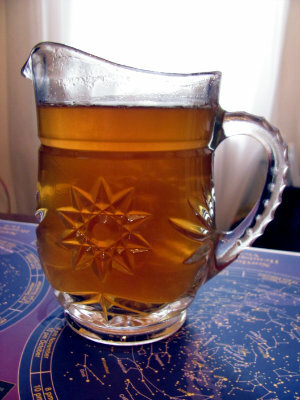 I purchased some mid-grade loose Jasmine tea and proceeded to make the world's most bitter, face-scrunching cup of tea. I purchased better leaves and got the same result. I tried giving the leaves an initial soak before letting them steep, just like what one would do for nicer green teas. Then I tried experimenting with water temperature. Then I resorted to covering the awful taste with loads of sugar. Finally, I gave up, blaming American water for...uh...not agreeing with Jasmine Tea? Or something. I resigned myself to only having delicious tea during trips to the far east. However, I had it in me to try to suffer through one more awful cup of tea. I decided to check the internet to see if there were any good ideas for iced Jasmine tea. At least, through the magic of the interweb, I learned what I was doing wrong: I hadn't removed the leaves after steeping for only five minutes. The leaves themselves will start leeching bitter oils if given enough time in hot water. It's stupid, but at least I figured it out after four years of bad tea. 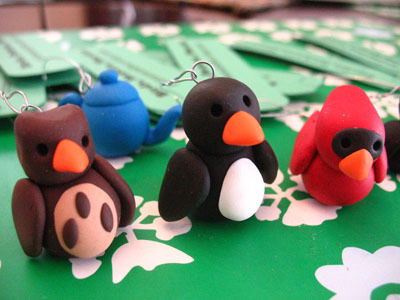 I'm making a batch of ornaments to ship out with this month's Little Black Box sample shipment. I need to make 100, so to avoid the tedium of making just penguins and cardinals, I've been experimenting with making some new birds. I'm about two thirds of the way through my task and I'm astounded by how much time this is taking me. I estimated that I could do about 30 birds per hour, but it's turning out to be about a third of that. I always overestimate my output! I think I'm going to need a break from polymer clay for a little while. I noticed a lot of new smudges around the kitchen sink, on some of the light switches and along some of the walls in the house. It look me a little while to figure out that they all came from me. There is something about the new, softer formula of that really makes it cling to the skin on my hands after a while. Even with intense soap and water, I still retain a patina of clay and the house is starting to look once again like a steel worker lives here. I think I need to find out whatever they use to clean baby ducks soiled by oil spills, buy a bucket, and spray the whole house with it. Clark's job moved locations and now he is in the position to drive home for lunch once or twice a week. It's been good for me as my day has been divided in a way that is a lot more healthy. I'll usually work without stopping to eat until 3 or 4 o'clock if left on my own, meaning that I eat only two small meals a day. Not good. Still, we're both short on time, so it's nice to eat things that can be prepared in less than 5 minutes. Today, I put rice in the rice cooker early in the morning. Then when Clark arrived I mixed up a quick batch of tuna with a little low-fat mayo and served that on a piece of seaweed on top of the rice. For garnish I sprinkled the whole thing with roasted sesame seeds. For those of you who are a little weirded out by seaweed, I say just give it a try. It's like eating potato chips that don't make you feel bad and give you a full serving of green vegetables. I like eating by itself for a snack; the salty-umami flavor is divine, but it's wonderful in a lot of dishes. Plus, it doesn't need to be cooked or prepared in any way. Just apply it and enjoy. This set of cake toppers was a disaster from the beginning. From the benign Barney the Dinosaur looks of my supposedly vicious T-Rex, to the total collapse of my Brontosaurs (which doesn't even exist anymore), this was a failure of design. I spent so long mix, mix, mixing the special sparkly color, that it's a little disappointing that these are destined for disposal. I don't know what to do with them, on the one hand it's hard to toss anything with that much time and energy behind it. But on the other hand, what can you do with a dinosaur with a broken neck? I'll use the T-Rex as a package embellishment for Christmas, but the other one will just have to serve as a lesson in hubris. Oh, and a lesson learned that long necks need structural integrity. I love reissued retro patterns. There is something about mid-20th century clothes that is so hard to find these days. Maybe it's the solidness and shape of the clothes. 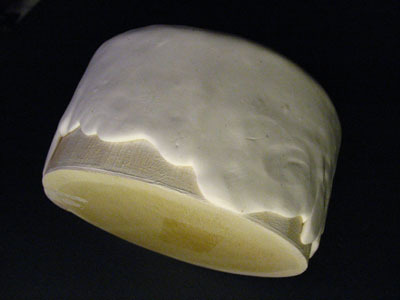 It's hard to replicate that using today's construction technique and fabric-buying short cuts. There are a lot of darts and a lot of yardage in this dress and I just can't image anyone taking the time. Still, it's a little like wearing armor. Wearing this kind of dress makes me want stand up and take charge of something. No one can push me around in a massive, tailored dress like this. I'm trying to improve my presentation in my Etsy store, so I decided to redo some of the pictures of my cake toppers in order to make them look more cake topperish. They are already a little unconventional, so anything to put them in context would be a service. My solution was to make it look like they are sitting on an actual cake. Real cake would just get old and get frosting all over them. Plus, I hate the idea of making a cake I can't eat. So, instead I made a reusable fake cake, one that would last and showcase my wares in the best way. My chicken Mary is special. Well, not "special", but extraordinary. She's not as big as her sisters and her feathers are a little more red than what is usual for a Rhode Island Red, but she also has a unique ability to tolerate having her picture taken. While Catherine and Elanor will peck and squawk when compelled to stay still, Mary takes it all in stride. Catherine and Elanor will walk immediately out of view range of my cacmera, but after being put back in place once or twice Mary will just stay and wait until you are done. She's behaved this way ever since we adopted her as a wee chick. I decided to press my luck today to see what we could accomplish with Mary's unusual amount of patience. I decided to enter her in the New Yorker's Critterati Contest, a competition to see whose pet makes the most convincing literary figure. I swear that I've never dressed up a pet before; I've always felt bad for dogs in sweaters. Mary has never worn a hat before, at least not a real one. I don't know, I felt...compelled to see if I could pull this off. We took a video just to show how still and regal she was. 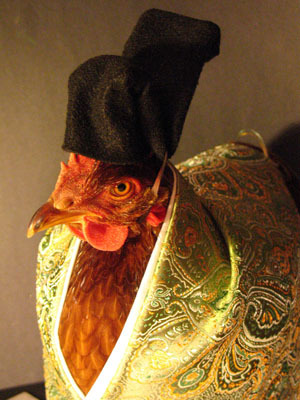 That, and to prove that we didn't just Photoshop a hat onto a picture of a chicken. I ended up really apologetic because her stillness was just so eerie. It's time for another Make-A-Skirt Thursday! The weather has been turning chilly, so I'm switching to warmer fabrics, namely corduroy. It's one of my favorite fabrics to work with. Despite its ability to keep out the winter chill, it's also breathable and wearable in summer heat. I put this skirt on as soon as I finished. It's been cold in the house during the day, but we can save money on heat if I dress warmly. I think this skirt will probably pay for itself a few times over in gas bill savings. I fully recognize that I'm not talented when it comes to drawing and painting. I spend a lot of time doing both because I enjoy them, but I usually end up drawing cartoons because I'm terrible at drawing things from real life. Still, I've learned some shortcuts so that I can make nice things without getting mad at myself for my inability to translate real things to paper. My favorite technique for making me look like I have more talent than I actually do is to make watercolor leaf paintings. The sneaky trick is to find a bunch of really pretty fall leaves and then trace them. Once that's done it's really easy to draw in the network of veins and suddenly I have a decent drawing from nature. I usually draw on in plain white index cards. They're the perfect size to give away as thank you cards and the limited size keeps this project short and sweet. Next I put down an initial wash of color. It's okay to color outside of the lines because it's nature and nature is messy. For real, yo! Put on subsequent washes of color over smaller and smaller areas to give the leaf depth. With practice it's easy to do a bunch at a time and spend less than ten minutes on each. Deadwood is my favorite show of all time. I think I've seen each foul-mouthed episode at least five times over. While Deadwood was never a place known fine cuisine, but it did have its moments. For example, Al Swearengen's take on hospitality whenever hosting a meeting of the important men of the camp. "Open the f***ing canned peaches!" Now that the domestic peach crop is coming to a close for the year it's time for me to make my own f***ing canned peaches in the true old-timey tradition. So, my mother was one of 18 children, and I feel like a lot of information that was held by my grandparent's generation didn't have a chance to get passed to the people in my mother's generation, and, in turn, didn't make it to my generation. I don't blame anyone for that, and I feel lucky that my grandmother's intense sewing skills made it down to me, but I still wonder how much information was lost because my grandparents were so busy raising baby after baby that there was no time to teach the older ones the kind of skills that go from parent to child. In summary, I have no idea what I'm doing. I've never canned anything before, and I've never even seen anyone can anything. Luckily, I have the internet to make up for this gap in domestic knowledge. I have resources to learn this new skill and hopefully I'll have the wherewithal to pass it on to the people will come after me. Still, mistakes will be made, lots of them. I then put spooned my peaches into a canning jar and used a funnel to fill it up to the top with syrup. My peaches only filled half of the jar, so next time I'll need to cut up more than four. Finally, I boiled the jar to seal it. I learned a few hours later from a friend that the water should be over the lid of the jar or the jar should be boiled upside down. Still, it sealed and seemed intact. I guess I'll find out whether I really screwed up in a week. **Update** I let the peaches sit in the cupboard for a week before trying them. They were super tender tasty! I think I'll cut down on the sugar in the syrup next time because it was way to sweet, but I'll probably use the leftover liquid to make peach sweet tea. Well, I had about three big salad bowls of pumpkin guts leftover from yesterday and it's a shame to let that all go to waste. I spent a good chunk of my day slimed up to my elbows pulling out the seeds one-by-one. It's not my favorite activity, but my frugal nature dictates that if there is something good to eat somewhere in a bucket of goo, I should find some way to get that good thing out and edible. So after straining pulp for about 45 minutes I ended up with wrinkly hands and a strainer full of seeds. I rinsed all of the remaining guts off and spread as many as I could on a greased cookie sheet in one layer. They're really sticky after rinsing, so be prepared to have a few cling to your hands no matter what you do. Luckily, they come right off in the sink. I ended up with more roasted seeds than we could ever eat. Luckily, pumpkin seeds are good for chickens. They're supposed to be a natural de-wormer. I hosted a pumpkin carving party today. We purchased too many pumpkins and then spent what seemed like forever cleaning out the guts and seeds. Those fancy white pumpkins are especially stubborn about getting cleaned out; I think I'll stick to orange ones in the future. It's not the cleanest space alien pumpkin carving, but not bad for an hour of actual work. Sukiyaki is a meal Clark and I like to cook for friends. It's a good example of a regular meal Japanese people actually eat at home, unlike teriyaki chicken or California rolls. It's also one of those meals that guests cook themselves, like fondue, although Sukiyaki is less likely to be a source of high cholesterol. It's also kosher non-dairy, gluten-free, and not too hard to make vegan, so it's a good meal if you're entertaining in a pinch and you don't know what dietary needs are going to come out of left field. The most time-consuming part of preparing the food is all the chopping. Our typical version will have cubed tofu, chopped cabbage, mushrooms, sliced carrots, thin wedges of Kabocha (Japanese pumpkin), and chunks of green onion. We'll buy additional ingredients like yam noodles, sukiyaki sauce, mochi and thinly sliced meat from the Japanese food store, but they don't need much preparation. The meat is even pretty cheap because it's in such small slices, so it doesn't take much money to feed 8-10 people. Traditionally, morsels taken from the pot are dipped into individual bowls of raw egg and eaten over rice. It's optional and often Clark and I are the only ones at the table to eat our Sukiyaki that way, but despite the fear about salmonella, it adds an extra level of tasty. It's soooo, good, especially the gooey chunks of mochi and the kabocha once it gets soft. I love eating this dish during the fall and winter. The windows usually fog up from the steam and the temperature in the house rises 5 degrees. It's just a cozy, friendly meal. There were some very lovely fabric stores in San Diego. I *heart* Rosie's Calico Cupboard. It's huge and crammed with lots of designs that I've never seen before, all nice 100% cotton. Clark even got into the spirit and purchased a yard of fabric in order to make a new pillow case. I'm usually bad about mending things or making things he requests in a timely manner, so I made a concerted effort to give him what he wanted. Pillow cases are one of the easiest things to make, ever. They're just a rectangle sewn on three sides and then cuffed and hemmed on the remaining side. I made mine in about 20 minutes. Oh, I should note that I used a serger to finish my seam edges. I would recommend using some kind of seam finish so that the case won't unravel when it gets thrown into the wash. Cutting out a circle skirt isn't hard. You'll just need a yardstick, some chalk and a little patience. First, fold your fabric to find the center point. Mark that. Now, if you have two yards of fabric, it should be 72 inches long and (ideally) about 59 inches wide. If you want to go for the maximum length*, then mark the edge of the fabric 29.5 inches across the width in one direction and 29.5 inches in the other. Now, mark 29.5 inches from the center across the length at a 90 degree angle from the two width-wise marks. Do that again for the opposite end. Now you will have a center mark and four additional ones laid out in a '+' shaped configuration. Make some more marks to fill in the edge of your circle, pivoting the yardstick around the center mark and going out 29.5 inches. Cut along your marks. Finally, just the hem is left. Folding up fabric to make a hem on a circle skirt is always kind of a pain. It's always annoying tying to ease in the excess fabric from the edge and it's usually about nine yards of sewing. No thanks. Instead, my edge finish of choice is bias tape. It adds a little contrast and no easing is necessary. If you're not familiar with sewing with bias tape I learned how to apply it properly from this tutorial. *I always recommend going for the maximum length at first. It's easy to remove excess length, but not vice versa. Most of the nuts, ~95%, were no good and filled with fuzz. The remaining ones could be collected, but only if you got there before the squirrels. One fall, with a eye towards finally trying our own chestnuts I went out daily and steadily collected an entire bucket-full. Unfortunately, I didn't know what to do with them and neither did my family. They stayed in the garage for months until they were finally redeposited in the backyard. I'd never tasted a chestnut until I moved to Japan where they are a common train-station snack. The nuts have a natural slightly sweet taste. In fact, they have little fat compared to other nuts and are considered to be a good diet food for nut lovers. I found cartons of chestnuts for sale last week at the farmer's market for cheap. Now, I will finally know what to do with my very own chestnuts. We're out in sunny, warm San Diego for the wedding of a friend. Is it just me or has Southern California improved a lot since the 1990's? Maybe I didn't know about such cultural highlights as the Vietnamese Sandwich or the Hawaiian Crepe, but they are definitely making this trip worthwhile. Magnifique! I always struggle a little bit to find projects to do while we travel. Clark and I prefer not to check bags and it can be a little difficult to come up with something where at least one of my tools won't get confiscated by airport security. I made little puffs of wool and used my barbed needle to mat them together into one solid piece. Unfortunately, it ended up looking like a matted fur-ball. Essentially, that's what a needle felted sculpture is, but I'd prefer if they didn't look it so much. Okay, take two. 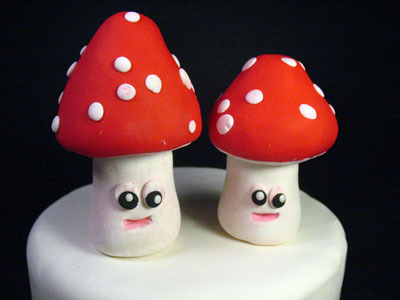 The more I look at the first set of wedding cake toppers, the goofier they look. So, I took a little extra time today and made a more serious set, with better actual wedding cake resemblance. I should package them with a seal that says exactly that. "NOW WITH ACTUAL WEDDING CAKE RESEMBLANCE!!" Oh, and "NOW WITH FRESH VANILLA SCENT!!" I will sell millions. I would need special tools to add faces to the people at the top of the cake. Do half inch tall people with no faces freak people out? I could spin it in a positive light. "NOW WITH DISAPPOINTMENT-FREE FACES!!" I'm Hispanic, but I wasn't raised in a culture that celebrates Dia de los Muertos. Instead, we celebrated All Saints Day and the children in my church could dress up like their favorite saint. It was a second, Catholic halloween and every year I dressed as Joan of Arc. We were expected to pray for the souls of our deceased friends and family, especially the ones that died within the year before, but not with the pomp and ritual of the Day of the Dead. It's a holiday I wish we had. To me, I wish there was a less painful was of saying hello/goodbye to loved ones every year. I'm on board for anything that involves a celebration and party favors and sugary treats in lieu of sitting alone and crying during the hard years. I think this is one of the goofiest, dumbest things I've made for a while, but they make me smile on some primal level, possibly the same primal level that secretly enjoys Ziggy cartoons. I'm glad that we, as a people, have managed to shed the confinement of pastel wedding colors and branch off into the more saturated areas of the color table. In fact, it's been ages since I attended a peach or mint green affair, two colors that seemed to be very popular circa 1974 according to my family albums. Even the weddings that I've attended lately with something pale like pink as a signature color always have something bold like chocolate brown to keep the palette from being washed out. I like it. I like reds and bright blues and deep, limpid purples. I love golden yellow bridesmaid dresses and wedding cakes that reject the traditional white on white palette. It's pleasant to attend a wedding and spend an evening stewing in a carefully selected set of colors. I'm kind of in love with bright blue and yellow as key colors right now. I made this coffee carafe and teapot out of some leftover blue polymer clay that transfixed me like a bower bird. Also, I'm a tea aficionado married to a coffee fancier, so I kind of hope that I don't sell this set and get to keep it for...I don't know...something. Um, a birthday? I'm already married, but everyone needs a teapot with a veil, AMIRITE?